Cap'n Transit Rides Again: Why do so many people care about curbside buses? Why do so many people care about curbside buses? In my post about the crazy law passed last week by the New York State legislature to (over)regulate private curbside buses in the city, I asked for help getting the word out. I got numerous tweets and retweets, and two of the three people I asked by name responded. Matt Yglesias wrote a nice blog post highlighting the burden caused by requiring a "traffic study" for each new bus stop permit, and noting the double standard for buses versus cars. John Stossel had a post highlighting the connection between private enterprise and innovation, which is particularly strong in the transit field. Some nice person also reddited my post. And for the record, I totally understand why Tom Vanderbilt didn't respond to my call. It's not really his area, while both Yglesias and Stossel have written specifically about private van services in the past. But thanks for everyone who took up the call! I doubt we'll get this thing repealed any time soon, but hopefully more people will be watching the next time this comes up. So I promised you an explanation for the bizarre urgency with which politicians and (non bus riding) "community members" achieved consensus on the issue of regulating (out of existence) intercity curbside bus pickup here in New York City. The explanations they gave - chaos, danger, congestion - were unsatisfying, in part because these were all things that were already regulated. I've got another explanation: barriers to entry. It's been widely observed that much regulation is pushed by existing businesses to make it hard for new competitors to horn in on their territory. Just the other day, Planet Money's Jacob Goldstein said that they like to "claim that they're dangerous" and need to be regulated. The more established private operators like Greyhound and Adirondack Trailways pay a "gate fee" to the Port Authority for use of their terminal. (This gets weird when small commuter bus lines like DeCamp get free buses from the New Jersey Department of Transportation to reduce their capital expenditures, because it becomes a net transfer of funds from the State of New Jersey to the Port Authority.) 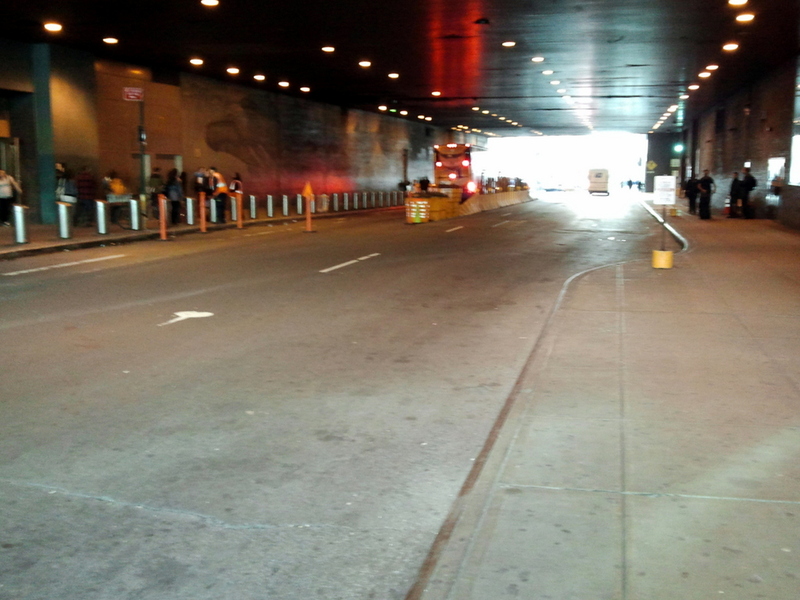 Curbside buses pay almost nothing for their street space, which was thrown in the faces of the established companies when Megabus relocated to 41st Street, in between the two wings of the Port Authority Bus Terminal. One weird thing is that Megabus is owned by the conglomerate Stagecoach, from the city of Perth in Scotland. You would think that it would then be the patriotic thing to support the companies that rent in the Port Authority, but the biggest, Greyhound, is owned by First Group, headquartered in Aberdeen, Scotland; we're really just pawns in some giant multi-generational clan war. The other big non-Chinese curbside bus company, Bolt, is a joint venture between Greyhound and Peter Pan (a family-owned business based in Springfield, Massachusetts). Stagecoach actually owns a whole portfolio of small profitable bus operators that rent inside the Port Authority under the Coachusa brand: Short Line, Red and Tan, Suburban. The lawsuit itself is more First vs. Stagecoach than anything else: Bolt is not trying for a near the Port Authority, and is not being sued, and the Coachusa companies haven't joined the suit. A big factor is definitely the established companies putting up greater barriers to their curbside competitors. There's another factor here, that I'll get into soon. That Stossel piece was just terrible. So he's comparing same-day Acela fare (did the Regional close down, or what?) to Megabus fare and quoting Randall O'Toole. Meh. And he's also totally ignoring Amtrak's vastly higher market shares to secondary markets, like Providence, where it offers better frequency and flexibility and the fare difference is smaller. Also meh. But to say transportation innovation always comes from the private sector requires a special kind of knowledge. And by "knowledge" I mean "ignorance of everything other than the history of the US in the last fifteen years." Rapid transit? Government invention, government funding. Expressways? Ditto. High-speed rail - the successful kind, not just the Special Olympics version in the US? That was invented by JNR. Bus network grids? Government-run transit agencies. Tram-trains? German transit agencies, and in parallel and in a worse-done way owing to less friendly regulations American ones. Verkehrsverbünde? Not only was that invented by the German-speaking public sector, but also otherwise far more competent private systems, e.g. in Japan, do not have that. If your concept of "innovation" is "a bus company drives on roads it doesn't pay for, uses curb space it doesn't pay for, and offers service that's only competitive because the rail alternative isn't better by large enough a margin," then yes, innovation is driven by the private sector. Probably comes from the same place that makes people think smartphone apps make more of a difference in transit ridership than timetable and fare integration, decent equipment, fewer and easier transfers, and other things that can't just be done by one photogenic American entrepreneur. the reason for the Port Authority is to keep the huge buses off the streets as much as possible along with the crowds. Curbside parking means traffic has to go around the bus and there is a crowd taking up sidewalk space. I buy a plane ticket i pay for the infrastructure required to support this. Same with bus riders. if you need to travel you should be willing to pay up the price of the infrastructure to support your decision. Bus stops are typically provided for free to carriers because they increase street capacity. Now, you are going to tell intercity buses to pay for permits while private commuter and MTA buses would not have to. See the problem? The city is just reaching into the pockets of people they presume are making money hand over foot. There are no other available bus stations in midtown Manhattan. Where is the new service supposed to go? Or is it that they want to CURTAIL the growth of new service by charging up to $275 per bus? "I buy a plane ticket i pay for the infrastructure required to support this. Same with bus riders. if you need to travel you should be willing to pay up the price of the infrastructure to support your decision." A lot of us downtrodden "bus riders" are also fancy airplane riders like yourself, fwiw. It is not really about who but what. Airplanes require uniquely expensive and complex infrastructure to operate at scale and it's sure as hell subsidized--we're never getting back the billions we pumped into the industry to keep it from collapsing after 9/11. For that matter, the dizzying cost to the public caused by that use of private airliners as bombs will never be recouped. So you might want to take a closer look at the bill before you brag about having paid all externalities of a jetset lifestyle. Intercity buses on streets cause the same problems as cars, though to a much smaller degree per passenger. We've chosen to tolerate auto-problems in general—but maybe we shouldn't? Let's convert a lane of auto traffic to sidewalks where there is sidewalk congestion. Set up cameras to efficiently ticket double parking and speeding by any vehicle, anywhere. Have city police do their jobs and ticket any reckless driver. Charge by the ton for the use of all of our expensive, deteriorating bridges. Eliminating car, truck, and bus subsidies sounds just fine to me. Gonna get fooled again, again? Who's sticking up for the bus riders? Why do we care about Willets Point again? Could the MTA ever run the Koreana van?